Toyohara Kunichika(1835-1900) Thirty-six Good and Evil Beauties: The Evil Omatsu, 1876. Oban. The story of the Evil Omatsu belongs to the genre of wicked women plays. Loosely based on the true story of Omatsu, an outcast who used her beauty to rise socially, marry and then poison her older wealthy husband, a blind samurai. She became an outlaw and gang leader and because she was female, was seen as a dangerous character in the rigid society of the time. This series is particularly fine and well regarded, with rich designs, full of atmosphere, sophistication and narrative. 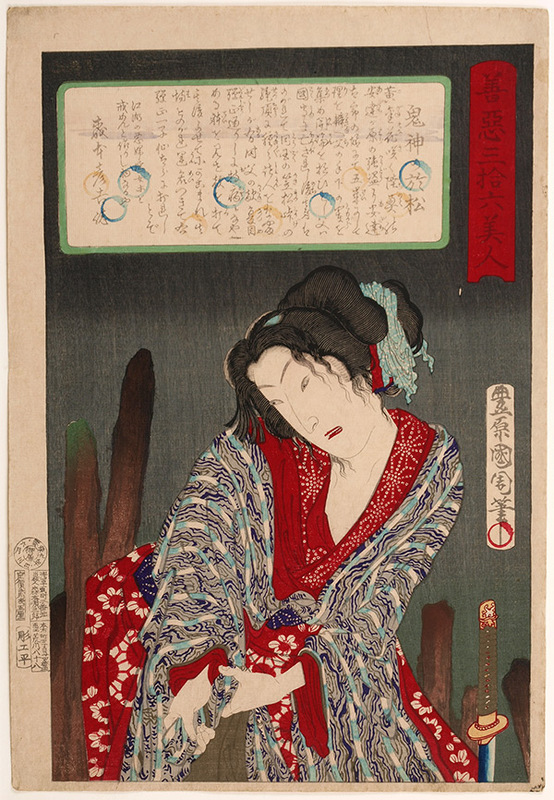 A beautiful print; Omatsu is finely drawn wringing her clothes out. Signed Kunichika hitsu, with Toshidama seal. The print is untrimmed, a very good state, strong colour and a fine early impression with embossing. The print is illustrated on page 58 of Amy Reigle Newland, Time Past and Time Present, Images of a Forgotten Master, Hotei Publishing 1999.